Where in Rhodes will it leave from? Will the ferry be ready to enter service on 8 July? How many people does the ferry hold? Thanks to fellow-blogger Adriana we know that the ticket agent for this ferry on Symi will be Lakis Travel. I’ve been asked about the technical specification of Sebeco, and all I can say is that I have absolutely no idea, and ANES have yet to release any details at all, which is surprising, you’d expect a series of information releases to gain press coverage and build up interest. The new high-speed craft for ANES has been photographed actually in the water, and carrying the name Sebeco. Greek shipping enthusiasts say the name is derived from a type of light, fast and manoeuvrable vessel used by pirates in the Aegean in past centuries. However, I hope ANES are not expecting to stop and seize ships at sea this summer. Now according to leaks (oh, not a great choice of phrase when discussing boats, sorry) the Sebeco, if this is her final name, would enter service this weekend. As far as I can tell, she has yet to complete sea trials and her safety inspection so this seems highly unlikely. The advisory commission on coastal shipping has approved both Sebeco and Symi II to operate as scheduled ferries on the Rhodes to Symi route, but final approval from the Minister has yet to be announced, nor has a timetable been published. Symi II did indeed perform the Sunday evening extra trip from Rhodes to Symi and back last week, but there’s no available information about whether it will operate again on Sunday 1 July. In the meantime she is keeping busy on her traditional Rhodes-Symi-Panormitis-Rhodes day trip duties every day. The Symi II has now received a licence to operate as a ferry between Rhodes and Symi, but only on a Sunday evening! The actual ship has always met ferry standards and was used as a ferry in the Sporades last year, it is the route licence that was missing. As the Sunday evening (19:30 Rhodes to Symi, 21:30 Symi to Rhodes) sailings don’t compete with any other operator, they’ve been approved without any issues, so far just for this weekend. Note that the Symi to Rhodes departure time is 45 minutes earlier than when the bigger “Symi” operated the route earlier this month. This is because the Symi II is purely a passenger ferry so no time is needed to unload vehicles, and it has always been quicker at unloading passengers than the “Symi” because the main saloon area is level with the exit ramp – no stairs involved. I’m in the process of updating the ferry summaries and these will appear as an update later today. Don’t panic if you can’t book this ferry on line with Sea Dreams yet, they seem a little slow at changing their website, but the sailings are loaded into the national booking system used by travel agents. UPDATE – Symi II operated the Sunday evening sailing again on 1 July – still no on line booking, no website information, no visibility on agency sites. Unless someone is paying them to run this service, it won’t last long as it is clearly aimed at foreign tourists coming to Symi, who won’t know it exists. Petalo – concrete – taverna and sunbeds – walk around south side of the harbour. Yiali – fine shingle, cantina for light refreshments. Walk around north side of harbour, then about 10 minutes walk beyond on coast road. May be able to get a lift on tourist train. Nimborio – mostly concrete – taverna, sunbeds. Extended this year. Attractive village atmosphere. Waterbus from Yialos, walk along coast road, or more strenuous walk over the ridge from the back of the square in Yialos. Path is surfaced. Pedi – fine shingle – two separate serviced areas each with sunbeds and taverna. Shops. Lots of small boats to look at. Symi Bus every hour from Yialos and Chorio. Also walkable from Chorio. Agia Marina – concrete – sunbeds, beachbar and rather upmarket taverna. Waterbuses from both Yialos and Pedi. There’s a roughish track from Pedi for walkers. Agia Nikolaos – sand and fine shingle – sunbeds, beachbar and taverna. Waterbuses from both Yialos and Pedi. Much improved track from Pedi for walkers. Nanou – medium shingle – sunbeds and taverna. Waterbuses from Yialos and Pedi, path suitable only for fit and experienced walkers. Marathounda – large shingle – sunbeds and taverna specialising in locally grown organic food. Waterbus from Yialos. Driveable unsurfaced track from main Panormitis road, walkable from the road junction (catch the Panormitis bus to get there). Minibus excursions from Yialos/Chorio. Toli – medium shingle – sunbeds and taverna. Theoretically has waterbus service from Yialos but sea conditions round the north end of the island often make this impossible. Road access (partly unsurfaced). Minibus excursions from Yialos/Chorio – transfer to truck for the unsurfaced bit. Then there are the remote west coast beaches accessible only to hikers and passengers on the Round The Island boat excursions – Agios Emilianos; Maroni; Agios Vassilios. None of these have any beach facilities. Finally comes the beach on Sesklia Island, large shingle, used as the barbeque stop on Round the Island boat excursions. You’ll also find a few tiny coves accessible by scrambling down from the Yialos-Nimborio coast road, a short stretch of sand at Panormitis Monastery, and a cove on Nimos Island. Panormitis has daily bus service from Yialos and Chorio, Nimos is rarely visited and requires a boat. Thanks to Melanie for a reminder that this week Lakis Travel started operating services using the Symi Bus to connect the new “big ferry” quay with the Clock Tower and with Chorio and Pedi at times to suit the Blue Star 1 or 2 and the Nissos Chios. All these ferries use the new quayside, indeed the Blue Star 1 and 2 couldn’t possibly fit anywhere else. Melanie says that passengers numbers on the new bus services were initially disappointing and I hope that Lakis persists for long enough to allow people travelling from elsewhere to Symi to find out that there is a bus connection off their ferries and use it. The Dodekanisos Seaways ferries continue to use the Clock Tower as their departure point, and of course Sea Dreams don’t currently have a ferry service at all. For those who missed the news, the Symi has gone off to the Sporades for the summer, and the Symi II has returned to her home island instead, but as yet she has no ferry licence so can only carry day excursion passengers. She uses the same berth Symi used by the bus terminal, which indeed was used by Symi II for many years. The Rhodes departure point of Symi II is not Akandia (because she doesn’t carry vehicles) but instead is at the landward end of the Tourist Port quay, just before the area used by ferries to Turkey. This saves Sea Dreams from staffing two separate ticket offices and makes provision of transfer coaches easier as they can be shared with the Marmaris excursions. Yes, it’s true. Tomorrow, something like 8 years after I travelled on her last departure from Yialos to Rhodes, Symi II will return to Yialos, operating the daily day-tripper run from Rhodes on behalf of Sea Dreams. But this is not currently a scheduled ferry service, you can only purchase day return tickets from Rhodes, and none at all from the Symi end, so the number of actual ferries to/from Symi is reduced. Apart from the barely started Sunday evening sailing, which now stops tonight, this does not matter much since the Panagia Skiadeni runs at much the same times but takes 30 minutes less on the way. The ANES high-speed ferry, which does exist and has been photographed, has yet to complete sea trials, but is supposed to provide a replacement ferry service in due course. Unfortunately nobody knows when “in due course” will be, since the ferry needs to complete trials, receive safety certification, and receive official approval for route and timetable. Hopefully the end of the month, but wheels grind slowly. On the same topic, the replacement of Blue Star Patmos on her runs through Symi is still scheduled for next weekend. So far Nissos Chios is only loaded into the reservation databases for the next 3 weeks, this is because government approval for the change is provisional and awaits confirmation for the rest of the season. Confirmation is required because this is a subsidised service and the name of the ship is part of the contract. Finally for today, the Kos-based high speed craft Iris Jet popped in and out of Yialos at around 8am today, as part of a journey Kos-Bodrum-Symi-Antalya which must surely be a charter of some sort. The latest rumour, which actually seems pretty firm, is that Symi II will resume service between Symi and Rhodes from 11 June in place of Sea Dreams vessel the Symi which will head off to the Sporades to do the work Symi II had been expected to do this summer. The logic seems to be that the vehicle-carrying capacity of Symi is not utilised to any great extent, particularly now that Blue Star 1 and 2 appear every Monday, Blue Star Patmos every Wednesday and Friday, and Panagia Skiadeni every day, and could actually be financially rewarding in the Sporades. Two side effects of this is that the Sunday evening sailings have disappeared from the Sea Dreams timetable after this weekend, and that Sea Dreams will also stop selling one-way or period return tickets after Sunday. So far there’s no sign of ANES, who after all own Symi II, selling tickets at all, so we may have fewer boats for people wanting to overnight or longer on Symi than appeared even 5 days ago. Of course there’s the promised ANES high-speed craft which might fill the gap. The idea that Nissos Chios “on hire to Blue Star” would do the Blue Star Patmos trips this high-season summer is no longer a rumour, it starts on 15 June. Of course Hellenic Seaways and Blue Star are now under common ownership so the cross-hiring is a paper transaction. In the same way, Blue Star’s Diagoras, having returned to Greece from Morocco, will operate some Hellenic Seaways sailings out of Thessaloniki. All part of matching ship capacity and speed to the route. Now I’m waiting to see if the ship swaps result in any other changes to departure and arrival times. This post is an updated version of one that appeared on my old blog. 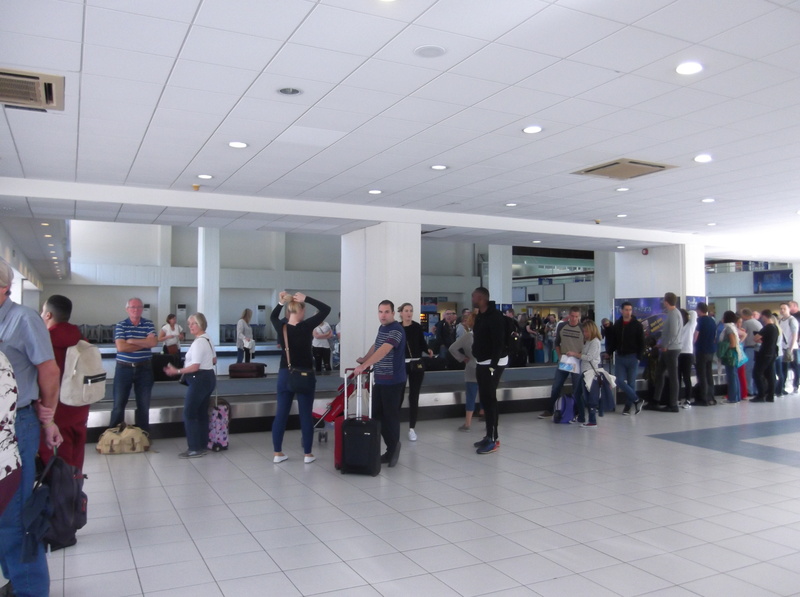 When you arrive at Rhodes Airport you’ll notice that it has no airbridges, the links from plane to terminal. Instead you’ll get off using stairs (make a mental note of the name on the side of the stairs), and usually squeeze into a bus for the very short journey to the terminal, where you’ll be dropped at a ramp leading down into the building. The right hand set of doors at the end of the ramp are for passengers on flights from inside the Schengen Area (most of the EU and EEA countries except UK, Ireland, Romania, Bulgaria and Croatia), and the left hand set, which takes you through Immigration, for everyone else. Don’t use the wrong doors, at best you’ll get shouted at, at worst arrested. Whichever set you use, you’ll eventually end up in Baggage Reclaim. There are four sets of conveyor belts, with screens to show you which belt your flight will use. Rhodes doesn’t have a good reputation for fast baggage return, due to package holiday airlines scheduling their arrivals too close together, though in practice domestic flights are speedy enough. While you’re waiting you can use the toilets but there’s not much else to do. Hopefully your bag won’t take too long and you’ll soon be on your way. If it doesn’t appear or is damaged you need to speak to the handling agent (could be Goldair, Skyserv or Swissport) who deals with your airline before you leave the airport. You can tell which by the name on the stairs you used to leave the plane. Their offices are in the baggage reclaim area or in the departures area (gates 1-14 zone). Leave the baggage reclaim area by the doors at the far end. Use the left hand doors if your flight came from outside the EU, otherwise the right hand ones. Once through you are into a zone full of tour operators reps and taxi drivers holding signs with peoples’ names on. Unless you arranged a taxi when you booked your accommodation on Symi, keep going through the next set of doors into the outside world. Now you have a choice – straight ahead across the drop-off area you’ll find the taxi rank – be careful crossing, driving can be erratic and you may be tired. The fare to Rhodes Town, including the port, is fixed, not metered, and currently is €25.00 per trip – up to 4 people. There are usually plenty of taxis but at busy times solo travellers may be asked to share with others going in the same direction, if this happens the fare is €25 per person or group, this is quite legal and you aren’t being ripped off. If you are going straight to the port, tell the driver the name of the ship you want and he’ll get you to the right quayside as close to the ship as possible. Alternatively there is a bus service, two or three buses an hour between 6am and midnight in summer. Turn left and walk along the side of the terminal past the first departures zone until you reach the bus shelter by a little seating area. Ideally you need to get tickets before the bus arrives as it is dearer if you pay on board, the cafe-bar in the departures area (desks 15-36 zone, door near the bus shelter) sells them for €2.50 per person. If you intend to come back on the bus as well you can stock up on tickets as each ticket works for one journey in either direction, the driver cancels the ticket you use as you get on. Luggage accommodation is limited, and the buses stop along the way, but the service is much faster than it used to be, about 40 minutes on average to the terminus in Averoff Street behind the Nea Agora building near Mandraki Harbour. You can also buy tickets from the driver at €2.60 per person (but you’ll probably need some Euro coins as change can be a problem). Look for buses marked Rodos Center, some start at the airport and some start at points further west and call in on their way to Rhodes Town.The same bus stop is used for buses going to and from Rhodes Town so do make sure it is going in the right direction before you board. These are usually blue and white buses, but there are some in advertising liveries. If you have decided to catch one of the high speed catamarans to Symi, these leave from Kolonna quay on the Rhodes waterfront. This is right by Rhodes Old Town walls (there’s a Kolonna Gate through the wall) and is an easy bag-trundle from the bus terminus at Averoff St (though avoid the rough cobblestones at the Old Town entrance over the bridge – they’re death to baggage wheels). Some day my bag will come. All other ferries to Symi leave from Akandia quay, which is a long way further on. I have walked it, but don’t intend to do it again on a hot day with baggage! If your ferry leaves from or arrives at Akandia, you are best advised to use a taxi. Akandia is served by Rhodes Town buses 6 and 12, but a peculiarity of the town service buses is that they have circular routes and only go one way round the circle. There is a flat fare regardless of distance, so going the long way round the circle isn’t any more expensive as long as you have 45 minutes to spare. If you still want to use these buses, the 12 runs hourly up to 3pm, and takes you to Akandia directly. The 6 runs hourly all day long and is a quick way from Akandia to the centre. These routes use a terminal on the seafront side of the road at Mandraki Harbour. Taxis can be picked up from the central taxi station at the Old Town end of the Nea Agora. A local journey to Akandia will be charged on the meter. Advance booking is possible, and is a good idea for the catamarans, but totally unnecessary for the Rhodes to Symi journey on Blue Star’s vast 2000-person capacity ships. There are ticket offices (or in some cases huts) right next to the mooring point of each company, and you can collect prebooked tickets or buy them direct there. Despite appearances to the contrary, you don’t need to find the main port agency to do this. If you have a wait at Akandia and your ferry hasn’t arrived yet (some come from Kastellorizo or Karpathos, others spend all day or all night in Akandia) there is a good taverna (Mouragio) just outside the quay entrance, and, new for 2018, a cafe within the port area. It now appears possible that the Blue Star Patmos will be replaced by Hellenic Seaways ship Nissos Chios for high season operations through Symi. Hellenic Seaways has just been taken over by Blue Star’s parent Attica Enterprises and a major timetable recast is under way. Then, Greek shipping enthusiasts report that old friend Symi II has left Piraeus after winter overhaul and has made her way to Rhodes via Panormitis, what she is to do there remains to be seen, she was originally going to operate in the Sporades again this summer. In other ANES line news, the new high speed craft has emerged from the shipyard that built her. Next will come sea trials, to see if the contracted performance can be achieved, safety inspections, and certification. Only then will she carry passengers. Rumours are that there will be a return to Rhodes-Symi, but they have yet to even apply for a route licence, let alone publish timetables. On Friday Blue Star Patmos used the new quay at Petalo, beyond the petrol station, for the first time. Blue Star was already using the quay for its Monday sailings by Blue Star 1 and Blue Star 2, and it seems likely that all Blue Star (and potentially Hellenic Seaways) operations will now use the new quay.